He really is more than an athlete. Fox News’ Laura Ingraham made the news this week for all the wrong reasons, when suggesting that LeBron James should just ‘shut up and dribble’ in response to his criticism of the Trump administration in a candid chat with fellow superstar, Kevin Durant. Suggesting he waive his right for freedom of speech, seems even more wrong when LeBron is such an influential figure in the #equality movement. He promtly responded with a single image on the gram saying “I am more than just an athlete”. And he’s right. The King donates millions of his own funds to community programs. Hell, he’s even put hundreds – actually – thousands of kids through college from his own bankroll. The King is single handedly making moves for equality that the government simply has not matched. Yesterday on one of the biggest days on the NBA calendar, he once again comittied to his protest. 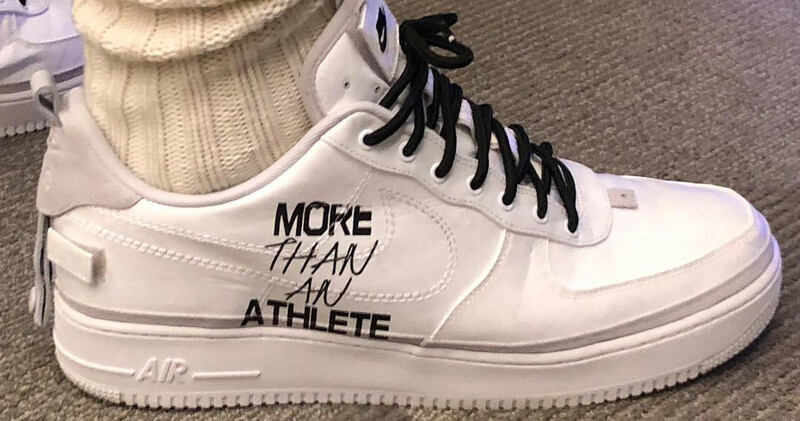 In his arrival to the All-Star game, he donned these custom 90/10 Nike Air Force 1’s with “More Than An Athlete” etched on the sides. NBA Commissioner Adam Silver backed up LeBron in saying he’s free to voice his political views and right to free speech. But the King backed himself up in taking out his third NBA All-Star MVP award in his team’s 148-145 win over Steph Curry’s mob, giving him yet another platform – the biggest yet – to confirm his stance on the issue. Well played, LeBron. Well played.